Be the first to share your favorite memory, photo or story of Ardeth. This memorial page is dedicated for family, friends and future generations to celebrate the life of their loved one. 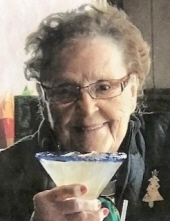 Ardeth M. McLaughlin (nee Magee), age 91, a resident of Carillon in Plainfield, IL, formerly of Chicago, IL, passed away on Monday, February 4, 2019 at Tabor Hills Healthcare Facility in Naperville. She was born on December 1, 1927 in Chicago. Beloved wife of 48 years to the late Michael J. McLaughlin, loving mother of Thomas McLaughlin of Destin, FL, James McLaughlin of Naperville, Kathleen (Kevin) Lavery of Naperville, Maureen (John) Eby of Oak Forest, IL and Patti (Marty) Fahey of Barrington Hills, IL, adored nana of Lindsey and Aimee McLaughlin and Lacey (Zac) Cordova; Bridget McLaughlin; Tim Lavery, Kelly (Chris Ream) Lavery, Katie (Craig) Dzierwa and Christine (Jeff) Tinker; Gavin (Ashley) Fahey, Connor Fahey and the late Trevor Fahey, cherished great-nana of Kenzie, Cody and Charlotte, devoted daughter of the late Carl and Josephine (nee Murphy) Magee, dear sister of the late Donald (Kay) Magee, fond sister-in-law of Frank (Pat) McLaughlin of California, aunt, great-aunt and friend of many. Ardeth grew up on Chicago's South Side and attended Mercy High School. She received a BA in Education from Chicago Teacher's College and taught for many years in the Chicago Public School System (CPS). Ardeth taught gym at Bates Elementary School in Chicago, IL for much of her career and later volunteered at her long time parish, Queen of Martyrs Catholic Church after her retirement. Ardeth was a member of Queen of Martyrs Altar & Rosary Society, served as a Eucharistic minister and made many of the banners inside the church. Visitation Thursday, February 7, 2019, 10:00 AM - 12:00 PM at Friedrich-Jones Funeral Home & Cremation Services, 44 S. Mill St, Naperville, IL. Funeral services will follow Thursday, 12:00 PM in the funeral home. Private Interment: Holy Sepulchre Cemetery, Alsip, IL. 60563, (630) 778-6677, taborhills.com. Donations will be used for staff appreciation and the Tabor Hills garden. To send flowers or a remembrance gift to the family of Ardeth M. McLaughlin, please visit our Tribute Store. "Email Address" would like to share the life celebration of Ardeth M. McLaughlin. Click on the "link" to go to share a favorite memory or leave a condolence message for the family.